Spooky Pinball crossed into the triple digit show range last month, and we’re not stopping there. This month we talk to Jack Danger, Bowen Kerins, and Bunyip van Es while we flip out on Alice Cooper’s Nightmare Castle in the shop. You’ll also get Charlie & Bug’s take on the recent Godzilla “drama” (we hate drama), and you’ll try out a new segment on “Dining With Spooky” where we once again visit Lawrence’s Pub and Eatery with our guest, Al Warner. You’ll have a chance to win a PinWrench Ultimate leg and backbox bolt wrench from Pinball Life, and of course you’ll hear from Dave & Danni on one of our favorite games, and James Willing in the E.M. Dungeon. You’ll get all this and more just for tuning your non existing radio dial to the Spooky Pinball Podcast! 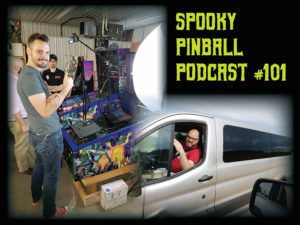 The Spooky Pinball Podcast Is Brought To You By Pinball Life Each And Every Month!